Catherine is heading to New York IBS to promote our HeadBed, and to help prevent any more trauma due to Beauty Palour Syndrome. Come and meet Catherine Randabel, the inventor of the HeadBed at the IBS New York show 6 - 8 March. Javits Convention Centre, New York. December 2015... L'Oreal Dubai has chosen HeadBeds for their next promotion in this amazing city. We could not be more proud ! Are you ready London for Salon International. 10-12 October at Excel London. Catherine and the HeadBed team will see you there. The latest article in Salon Business May 2015. Catherine and the team from Cindarella Paris had an amazing time at the MCB. Sydney Hair Expo - what a brilliant show. IT’S GETTING HOTTER. THE NEW HEADBED FOR ULTIMATE WASH BASIN COMFORT. We had to head all the way to New York to catch up with Mark Wolley from Electric UK. And Catherine got an amazing "Mia Farrow" cut from Mark. 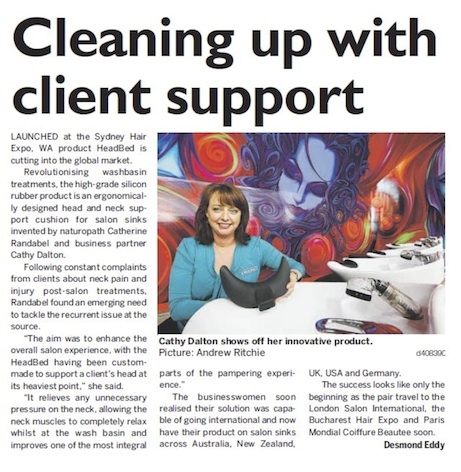 Hairhouse Warehouse, a multiple award winning company with 141 salons around Australia is the first company in the globe who quickly recognised the benefits of the HeadBed product for their client’s wellbeing and safety and have made it a priority for ‘HeadBeds’ to be on every one of their salon sinks throughout Australia. HeadBed makes the news in the United Kingdom... Our UK HeadBed representative, Adrian Hanlon was interviewed by the Chelmsford / Brentwood Gazette Nov 2013. HeadBed is very supportive of education and correct practices within the Hairdressing Industry. Sally Styles, CEO of the Hairdressing Council of UK, was so impressed with the HeadBed that she proposed a joint marketing initative, which will be launched soon. So watch this space! HeadBed went to the Sydney Hair Expo 2013 and we all really enjoyed ourselves. We were at the Vidal Sassoon Academy stand to show our HeadBed, neck and head cushion for salon washbasins, and we received such great feedback. 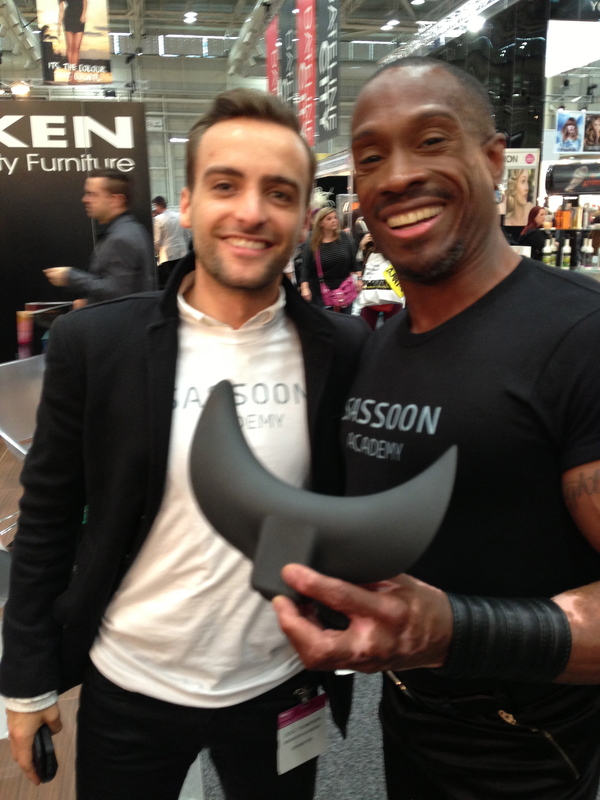 Here are some comments from Vidal Sassoon Academy - Cole (UK) and Dwight (USA) who loved the HeadBed. Big smiles from the Vidal Sassoon Academy boys! We are so happy that they loved the HeadBed. We would love to meet you and show you the HeadBed! Come visit us at one of the following expos. New York IBS International Beauty Show - 9-11 March 2014. 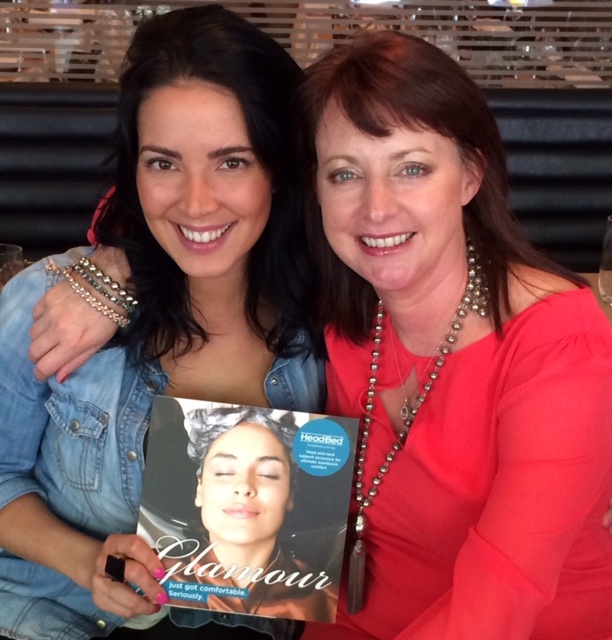 Come and see us at Salon Melbourne - 23 and 24 March 2014 - Stand 1018. Fantastic show special on offer.